In 1964 a small group of school leavers started making films as a circle of friends on the smallest film gauge of 8 millimetre – hence the Group’s name. In the Group’s early days, Circle Eight produced a procession of slapstick comedy films, one of which became the longest amateur film ever made in the UK at that time. Made in 1965, it lasted for 3 hours 41 minutes with two intermissions! The comedies changed to horror and drama in 1970, when the Group produced ‘The Haunting’. It proved to be so convincingly horrific that Circle Eight were unable to show it to the public as it was banned by Surrey County Council’s licensing authorities! The same film redeemed itself the following year, when it won the top three awards at the London Amateur Film Festival. 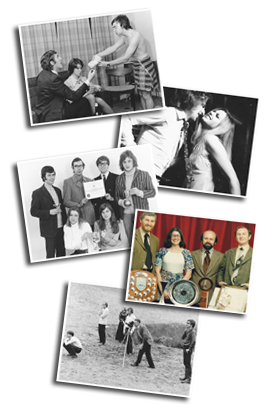 By 1969, the Group had started to show their latest work to local audiences in their tented cinema at the annual Guildford Show and added to their achievements in 1977 by producing a film of the annual Guildford Carnival Procession. After filming the progress of the Carnival through the town on Saturday evening, the 16mm footage was rushed up to London for processing and editing overnight and then shown to capacity audiences in their cinema tent at the show the following day. It proved a great success at a time when video was still in its infancy. 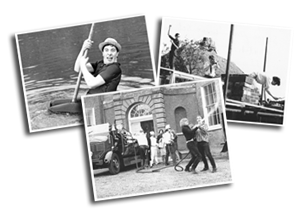 Since the early 1980s, Circle Eight has concentrated on producing historical local interest films featuring the legends and folklore of Surrey and its county town Guildford. The first of these ‘The Tales of Olde Guildford’ was premiered in 1984 and its sequel ‘The Tales of Olde Surrey’ followed in 1989. Both films have now been seen by over 50,000 people from all over Surrey and beyond and are also available on VHS video from the Guildford Borough Council’s Tourist Information Centre. In 1991, Circle Eight produced their much-acclaimed Victorian Lantern Slide show ‘Grandad’s Guildford’ . In 1995, their documentary film ‘Guildford…This is Guildford!’ celebrated the 150th anniversary of the arrival of the first train in the town back in 1845. 1996 found Circle Eight celebrating the centenary of the cinema with ‘Grandad’s Picture Palace’which traced the history of Guildford’s cinemas and told the story of Surrey’s pioneer film makers. In 1998, Circle Eight became the first amateur film group in the UK to make a full-length documentary on the life and times of Lewis Carroll – the author of ‘Alice in Wonderland’ and ‘Alice Through the Looking Glass’. Circle Eight’s ‘Alice Through the Camera Lens’ was made to celebrate the centenary of Lewis Carroll’s death in Guildford in 1898 and tells the story of his life in Oxford and Guildford. Requests for showings of ‘Alice’ came from as far away as Derbyshire, where a Lewis Carroll Centenary Festival was being staged to mark the author’s death. A Circle Eight projection team made a special journey to Buxton to present the film, where it was received by an enthusiastic audience. In August 1998, ‘Alice Through the Camera Lens’ was also presented at Lewis Carroll’s old Oxford college Christchurch as part of a week-long centenary event staged by the prestigious Lewis Carroll Society. Throughout the 2000s, Circle Eight continued to make video productions for entry into annual local and national film competitions and enjoyed further success with them. However these productions initially took second place to the completion of our major Millenium project ‘The Tales of the Pilgrims Way’, in which a group of Morrismen dance their way along the old pilgrims way from Winchester to Canterbury, investigating the tales, history and folklore to be encountered along the 133 mile route. The acquisition of a DVCPro video camera in 2001 was the first step in the changeover from film to video for future work. In May 2002 we were successful in receiving a lottery grant from ‘Awards for All’ for the purchase of a new video projector, enabling our current and future productions to be shown using the video format. 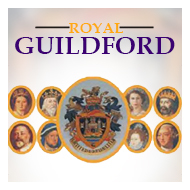 With a grant from Guildford Borough Council, we were able to produce a 79 minute video ‘Royal Guildford’ to celebrate the Queen’s Golden Jubilee. 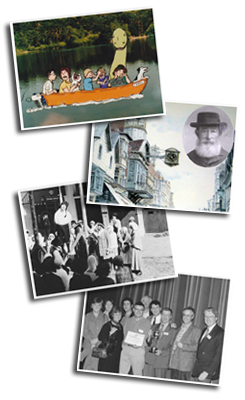 Circle Eight celebrated its 40th Anniversary in March 2004, for which we produced an autobiographical movie ‘Eight over Forty’. Filming was also completed that year of ‘The Grand Hall’. 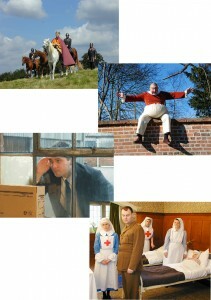 Our 13 minute local history production ‘The Story of Guildford’ won the top award at the Surrey Film & Video Festival in 2006, and our comedy production ‘With a Purposeful Gait’ was also an award winner in 2007. ‘Off the Wall’ and ‘Trapped’ completed our film making activities for this decade. 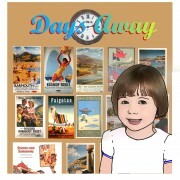 We were delighted that our animated film ‘Days Away’produced by our ‘in-house’ animator Norman Lilley won the animation award at the Surrey Film & Video Festival and followed this by winning the prestigious Best Animation award at the British International Amateur Film Festival. 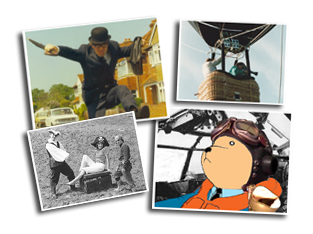 Our animators Norman and Chris Lilley have now produced a series of sequels to ‘Above and Beyond’, the very popular animated movie about the World War II teddy bear and his adventures, entitled ‘The Phantom of Milford St Giles’ ‘The Messenger’ and ‘Remembering Ted’. 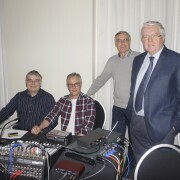 We also updated our live presentation ’70 Years at the BBC’ into a two part 95 minute production that tells the story of Guildford resident Reg Patrick and his son (and our Chairman) Terence Patrick’s working lives at the BBC in radio and television between the years 1925 and 1999. 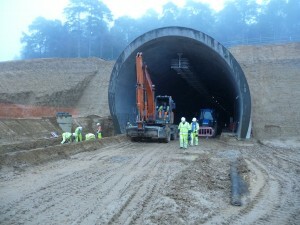 In September that year, we managed to arrange unique access for an amateur film group to what was at the time Europe’s largest engineering project, the Hindhead Tunnel on the London to Portsmouth road, and spent half a day filming in and around the Tunnel works. We completed our short comedy film ‘Unfinished Business’, which incorporated some footage from ‘A Turn for the Worse’ produced on 8mm between 1973 and 1976. This allowed us to feature the same actors then and now, which added a lot to the production. Our Chairman Terence Patrick was elected Mayor of Guildford for 2011/12 and so was forced to take a back seat from making films for a year. However, further awards were won in IAC Competitions for ‘Remembering Ted’ and ‘Unfinished Business’. A re-edited and shortened version of our local interest feature films ‘The Tales of Olde Guildford’ and ‘The Tales of Olde Surrey’ was completed under the new title of ‘Surrey Tales’ and proved popular with local audiences. 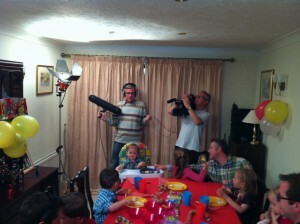 By now, all our productions are being shot on our newly acquired Sony High Definition widescreen camera. 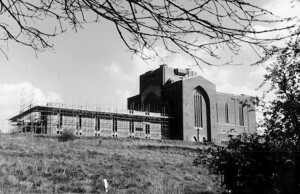 April saw the premiere of our film ‘The Story of Guildford Cathedral’ produced to celebrate the 50th Anniversary of the consecration of the Cathedral. Originally made some 10 years previously as a 22 minute film, it had now been re-edited and brought right up to date with additional material, and was premiered in the Nave of the Cathedral itself, using an enormous 16 foot screen and raising over £1,500 for Cathedral funds. A new comedy animation film ‘The Griddly Fatlow’ was also premiered and received the Best Club entry in the annual SERIAC Film & Video Competition. In January, we also premiered another local interest production ‘The Mayors of Guildford’, telling the story of the many fascinating, distinguished, philanthropic, and downright devious citizens who have held the office during the past 650 years. Circle Eight’s editing equipment was upgraded with the purchase of a new laptop and Matrox system. As a result, we re-edited and dubbed new versions of stories from our previous ‘Tales’ series of local interest films to make two stand-alone productions – ‘The Holy Rood of Grace’ and ‘Mother Ludlam’s Cauldron’. A new comedy film ‘Crumbs’ was completed towards the end of the year, which involved every member of the group in front of the camera (some of them for the first time). This was a very important year for the Group as we celebrated our Golden Jubilee Anniversary. The year’s events kicked off with a party on 26th March, being the actual date upon which the Group held its first meeting in 1964. The Group held a 50th Anniversary Dinner at the County Club in Guildford for 70 people, which was attended by many of the actors and members who had taken part in Circle Eight productions over the years. At the dinner, we launched our special 44 page Bumper Picture Book telling the story of the group since 1964. To commemorate the Centenary of the start of World War I, Circle Eight produced a new documentary ‘Guildford in the Great War’, which was premiered on July 19th and has since proved to be a great success. The film was adapted from a book of the same name that was published in 1934 and tells how everyday life in Guildford suddenly changed to cope with the war effort between 1914 and 1918. It also recalls the 492 men from Guildford, who enlisted for active service in the war to end all wars and never returned to their home town. This film has been a very popular choice for shows this year and its popularity has continued well into 2015. 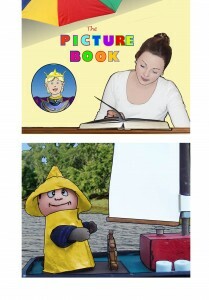 Production of two more animated films ‘The Boatman’ and ‘The Picture Book’ were also completed during the year. The Club was responsible for the projection of the British International Film Festival’s Award WInners show at Sittingborne in Kent, during the weekend of April 16th and 19th. 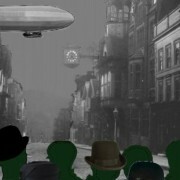 Circle Eight entered four films for the Festival and won awards for ‘Zeppelins over Guildford’, an animated excerpt from ‘Guildford in the Great War’, as well as ‘Crumbs’, ‘The Boatman’ and ‘The Picture Book’. Production has now started on another local history documentary on the history of Hindhead and the construction of the A3’s Hindhead Tunnel, which opened in 2011. As part of the Institute of Amateur Cinematographers’ celebrations for the 50th Anniversary of the introduction of Super 8mm film, we were proud to be invited to show our documentary ‘Tug’ which was a Ten Best Award winner in 1979. Production of ‘Tunnel under Hindhead’ continued with an appeal to local people for their films, photos and anecdotes. This received a good response and five interviews were then filmed with a variety of people who had an involvement with the Tunnel issue. 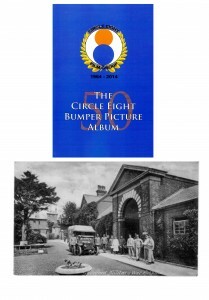 We received an unusual request in February to tell the story of Circle Eight to the Horsley Preservation Group, which has been repeated subsequently elsewhere. 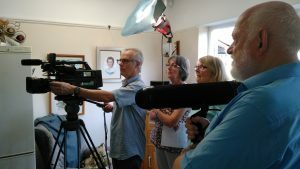 Production commenced on ‘Hazel & Peter‘ which tells the fascinating story of Hazel, a child actor in 1930’s and her husband Peter, a member of the famous Pathfinder Squadron. During the year we upgraded our presentation equipment to a new dedicated laptop on which virtually all our productions have been loaded so that a separate Powerpoint presentation can be prepared in minutes depending on the choice of films to be shown. Awards were won for Norman Lilley’s animation film ‘The Vacuum Cleaner‘, including the SERIAC Film Festival award for Best Animated Film. The latest production from our animator, Norman Lilley, had success at the 2017 IAC and SERIAC film competitions. Titled ‘The Tooth Fairy at Christmas’, the film won a 3 star award at the IAC British International Amateur Film Competition and won the Paterson Cup for Best Animation at the SERIAC Film Festival. We participated in the 20th Anniversary celebrations of Guildford’s Electric Theatre in July with a showing of ‘Grandad’s Picture Palace’ and ’50 Not Out’. 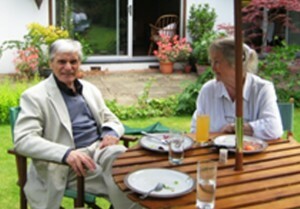 Filming has been completed of interviews with a fascinating couple for our new production ‘Out of The Blue’. Hazel was a child film star in the 1930’s and was billed as England’s answer to Shirley Temple. Peter was a member of the famous Pathfinder squadron during World War II. Research is underway to select suitable stills for inclusion in this film. Shooting of the atmospheric drama ‘The Dream’ was concluded in September with a successful shoot at Wittering Beach. Editing has now started and is likely to take up the next few months. Filming has now been completed on our new local interest documentary ‘Tunnel under Hindhead’. Work is now underway on transcribing the interviews which we had filmed with local people affected by the Tunnel and its construction. Finalisation of the script and editing work will follow in early 2018. This year has seen the completion and Premiere of the three latest productions for the Group. 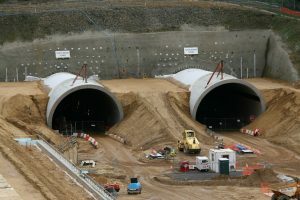 ‘Tunnel under Hindhead’ tells the story of the history of Hindhead and of the construction of the Hindhead Tunnel on the A3. This film, together with our new mysterious drama ‘The Dream’, and the new documentary ‘Out of the Blue’ were all completed by June. 21st July saw a sell-out audience for the Premiere of the three new films at The Electric Theatre in Guildford. 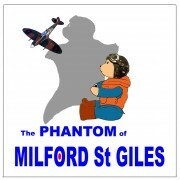 The programme was completed with a showing of ‘Guildford in the Great War’. Further showing of the new films to local audiences are taking place throughout the rest of the year.